If you've never heard of Chinese automaker Geely, it's because it doesn't sell cars in the US. However, with stakes in Volvo and Lotus, it may be time to take notice. We knew the Chinese automaker was planning to release a new electric car under an all-new brand and the results of this endeavor have finally come to fruition. Geely has just announced its new electric brand called 'Geometry' along with the first model, the Geometry A. 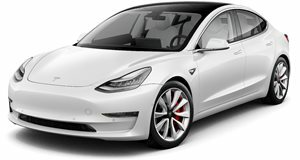 Like the Tesla Model 3, the Geometry A is an electric sedan available with a standard range and a long range version in six different configurations. The Geometry A uses CATL ternary lithium batteries with a capacity of 51.9kWh on the standard range and 61.9kWh on the long range. Geely claims the standard range can travel 410 kilometers (254 miles) on a charge while the long range model can go 500 km (310 miles), though we have seen EVs lose range when tested under EPA standards. Geely has ensured that the Geometry A should retain its range under all circumstances (like in cold weather) using "Intelligent Power” technologies like an intelligent high-efficiency electronic control system, HEDS High-efficiency electric drive system, lightweight high energy intelligent battery system, and ITCS Intelligent Battery Temperature Control System. The electric motors produce 120kW (160 horsepower) and 184 lb-ft of torque resulting in a 0-60 mph time of around 8.8 seconds, so you won't have any Teslas beat off the line with acceleration. Still, the Geometry A can fast charge from 30% to 80% in just 30 minutes and can even be used to power electronic devices using its Super E Energy Station system. Like a Tesla, the Geometry A has advanced Level L2+ Intelligent Drive semi-autonomous features. The car is equipped with multiple cameras and millimeter wave radars to track objects around the car. To make the car even safer, it includes a one-button intelligent automatic parking system, 360-degree camera, voice assistant, and HD driving recorder. If this all sounds interesting to you, just wait until you hear the price. The Geometry A starts from 210,000 Yuan for the standard range A2 model, which translates to just $31,250 before subsidies. With Chinese market subsidies thrown in, the base model will cost the equivalent of $22,321. Even the fully-loaded long range AN model only costs $37,200 or $28,274 with subsidies. While Geely has listed a conversion to US pricing, it hasn't announced if the Geometry A will be sold in the US.